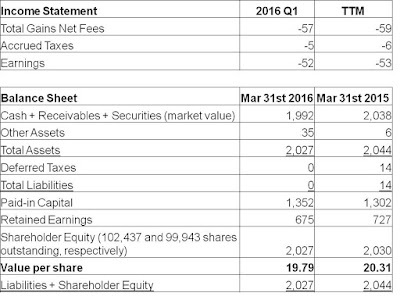 For the first quarter ended March 31st, 2016, KVF lost $0.51 cents per share, decreasing the value of each share to $19.79. Currency losses (as the Canadian dollar strengthened against the USD), however, were $0.53 cents per share. Currency movements can have a dramatic effect on earnings in any one quarter in either direction, but over the long-term they are likely to make little difference to returns. As such, my focus is always on the portfolio's return ignoring currency. To that end, portfolio returns for the quarter were essentially flat, matching the major indexes usually quoted here, which were anywhere from down in the low single-digits to up in the low-single digits. These end results make it sound like a boring quarter, but it was anything but. Securities fell rather markedly to start the quarter, but recovered in the last month. KVF saw rather dramatic declines in its cash position midway through the quarter, as I tried to take advantage of some mispricings, but that cash position is back now as the market has recovered. Among the names that were picked up during the mini-selloff was Dawson Geophysical (DWSN), a cash-flow positive energy services firm that traded for not much more than its net cash position. As the quarter wore on its price soared some 50% from its lows, and so it is no longer in KVF's portfolio. In general, KVF does not hold companies in the commodities space as pricing for the underlying materials on which these houses of cards are built is generally volatile and difficult to predict. But these have been exceptional times, as pessimism in the commodities space has at times created some extreme value opportunities, as was the case with Dawson. 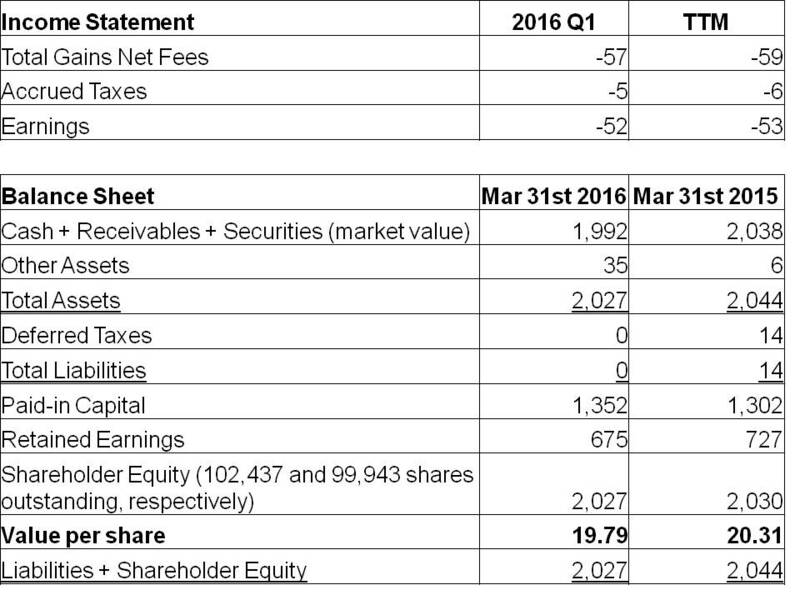 Once again, US stock prices are rather high, and therefore KVF's cash level is rising as is its international focus.